Glass can be a simultaneously wonderful and frustrating material to work with. While it looks great and enhances the visual appeal of most crafts, it is also incredibly fragile and heavy. There is also a lot of drama involved when glass breaks. 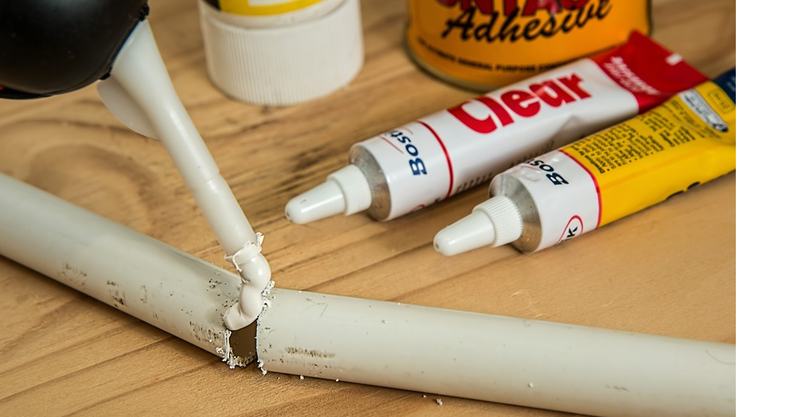 If you work with glass or have a couple of glass crafts lying around, then having a tube of high-quality and reliable glass glue will prove to be incredibly handy. In this article we have compiled a list of the best glass glue brands, so all you have to do is pick one (or several). What to look for in a glass glue? When shopping for glue for glass, keep in mind that you don’t need to restrict yourself to only glass glue. While there are glues that are specially formulated for glass, there are also glues that can work across a wide range of materials. 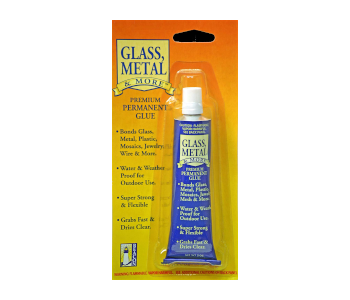 These are particularly useful if you need to glue a piece of glass into another material, such as metal or wood. Thus, you need to establish a definite intention before you decide on which glass glue to buy. 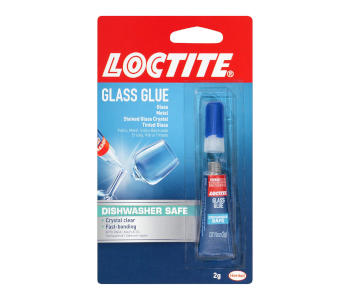 If you’re looking for a glue that is specially formulated for bonding glass, then you probably won’t need to look any further than this Glass Glue from Loctite. Made with a unique butyl formula, the Loctite Glass Glue can work with all types of glass and crystal – clear, tinted, opaque, or stained. It bonds instantly, is crystal clear upon drying, and is heat and water-resistant. With over 50 years of experience in providing advanced adhesive and sealing solutions, Loctite is one of those brands that you can completely rely on. 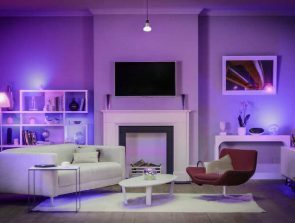 This entry is more of a play on versatility, as the Cyanoacrylate Glue from GlueMasters can work across a huge range of materials: wood, ceramics, plastic, rubber, and of course, glass. If you’re heavily into DIY crafts, then is the perfect all-around glue for you. 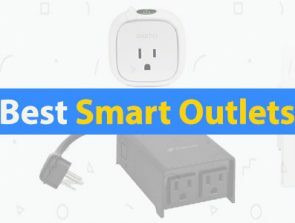 It’s waterproof, fast-drying, and is known for having industrial-grade strength. The Cyanoacrylate Glue comes in three viscosity variants (thin, medium, and thick) giving you the option to choose which type will be best for your application. If there’s a downside to this glue, it’s that it turns white when it gets wet, so you might not want to use it for clear glass-to-glass bonding. Still, in terms of reliability and versatility, this glue is top-notch. Another entry from Loctite, this liquid Super Glue is a more versatile product that works well with wood, fabric, metal, ceramic, and glass. It bonds almost instantly – in just 5 seconds – which may be either a good or bad thing, depending on your penchant to change your mind. When dry, the Loctite Super Glue retains a clear and shiny finish. The low viscosity of the glue combined with the pinpoint nozzle makes it perfect for making repairs to small details in toys and figurines. 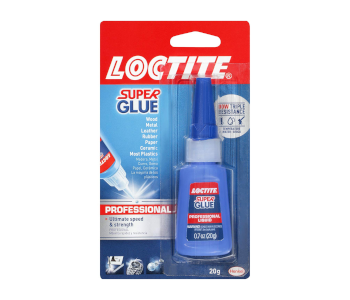 Even if the Loctite Super Glue can be difficult to use for big repairs, it is still a worthwhile addition to any toolkit. 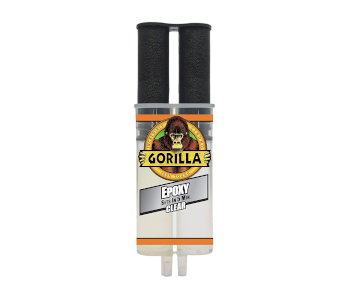 If you’re the type of craftsperson who is prone to making small adjustments to parts after you have set them in place, then the 2-part Epoxy from Gorilla was made just for you. The setting time of this epoxy is 5 minutes – plenty of time to make last-minute adjustments. Don’t let that fool you, though. The Gorilla Epoxy creates a strong and permanent bond once it has set. Its low viscosity allows it to fill gaps and small holes with the help of a fine-tip syringe. It has a crystal-clear finish when it dries, so all your repaired items will look as good as new (well, almost). Aside from glass, the Gorilla Epoxy also works well with ceramic, tiles, wood, and most plastics. Despite not being as popular as the Loctite or Gorilla brands, the E6000 has managed to become very popular especially among the crafts industry. 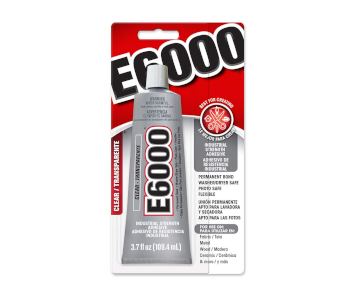 The E6000 Craft Adhesive is commonly used to repair figurines, porcelain, ceramic, and glass items. It even works with leather, rubber, vinyl, and some plastics. Once dry, it is waterproof and heat-resistant. The E6000 was specially formulated with craft-making in mind. Despite its strength, it retains a good measure of flexibility when dry. It is crystal clear and is easily paintable, so it should not detract from the aesthetics of your crafts. 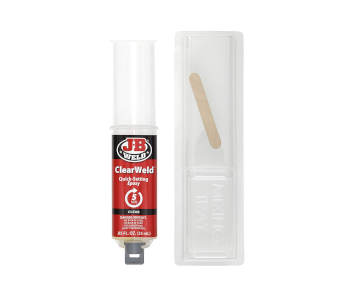 The J-B ClearWeld, as its name implies, creates a bond that is virtually as strong as a cold weld. This 2-part epoxy will work on a wide range of common household and industrial metals including wood, metals, ceramics, most plastics, and glass. 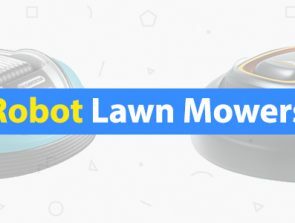 It was specifically designed to withstand harsh conditions, so the bond will not be compromised even in extreme heat, cold, or moist environments. It’s also a very simple product to use: just mix the two components on a 50:50 ratio and apply to the desired surface. The epoxy sets in 5 minutes, giving you plenty of time to make last-minute adjustments. 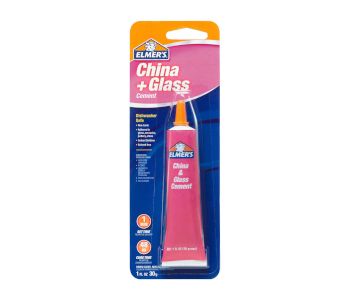 One of the most established names in the market of adhesives, the China and Glass Cement from Elmer’s is also a highly reliable option. It was specially formulated for glass, ceramics, and China, and dries with a crystal-clear finish. It is waterproof, heat-resistant, and dishwasher-safe. The best thing about this product is that it’s non-toxic, so you go ahead and use it to fix your broken plates and mugs. 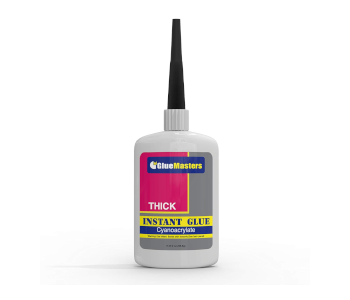 This glue sets in only one minute, allowing you to repair multiple items in hardly any time at all. 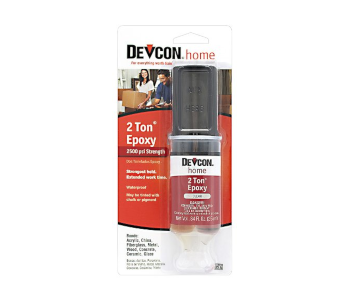 As the name implies, the Devcon 2-Ton epoxy is made for extremely heavy-duty use. It has good impact strength, is non-shrinking, and retains good clarity once it dries. Aside from being waterproof, it was also formulated to withstand solvents, gasoline, oil, mineral spirits, and anti-freeze. The epoxy retains its strength in extreme hot and cold and can be used for acrylic, metal, glass, concrete, and ceramic. However, this is not your ideal epoxy if you’re in a hurry. The Devcon 2-Ton Epoxy has an extremely long setting time of 20 minutes, with full curing only expected after about 12 hours. 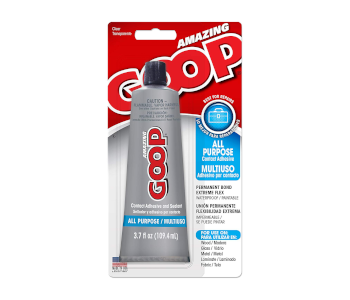 The Amazing Goop eschews the complexity of two-part adhesives and comes with just a single component. Unlike other super glues, the Amazing Goop retains good flexibility when it dries. It won’t crack or turn brittle even after a long time. It’s waterproof, temperature-resistant, dishwasher-safe, and is an excellent all-around adhesive for your household needs. It just gives off a strong odor as it sets, but this smell dissipates in short order. This premium glue from Beacon was made to work with a wide range of materials and has performed exceptionally well in bonding glass to glass or glass to metal. It takes some time to work – about an hour to set – so it may not be for you if you’re in a hurry. You might even have to resort to creative means to keep pressure on the separate parts as it takes 24 hours for the glue to fully cure. However, the bond is rock-solid but still flexible when it dries. Since the glue dries clear, it is an excellent option for repairing glass items. The glue is also reliable for outdoor items as it is waterproof, weatherproof, and heat-stable. 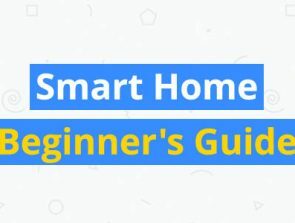 Glass seems like an intimidating material for people who are into DIY crafts but working with glass can be easy as long as you have the right tools. A high-quality glass glue can also be very useful if a glass item breaks in your house, which will almost inevitably happen. We hope that our list of the best glass glue products has helped you pick one that you can add your crafting arsenal.